This is the saddest news to report, ever. You are a Major League baseball player, playing shortstop for one of the biggest historic franchises in the Boston Red Sox. You win the World Series. Let me say that again, as there are many, many players that go a complete career in baseball without even playing in one. There is always a ring ceremony the following season, where each player from team is given a specially made World Series ring. Each one is unique, each one is special, and each one is coveted by their owners. Picking up your World Series ring is one of the great honors in baseball. 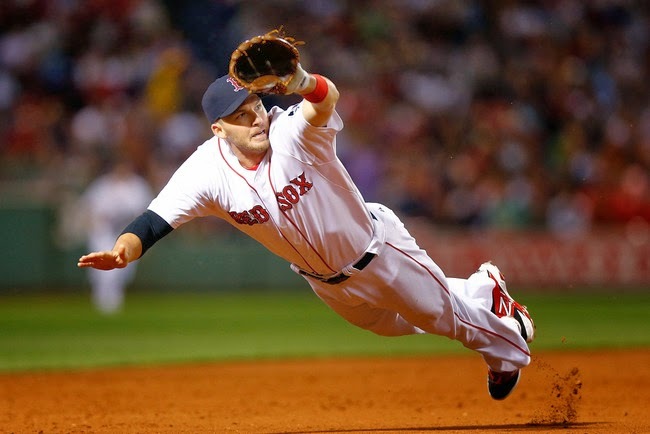 Stephen Drew, the Boston Red Sox shortstop in 2013, is not expected to attend the ring ceremony tomorrow at Fenway Park. It was reported that two of Drew’s ex-teammates, who were hoping to see him, felt that Drew would feel uncomfortable at the event based on the way things have unfolded for him. Too bad that you missed Spring Training after turning down a $14.1 million offer. Too bad that all the teams turned tail and left him training down in Florida at a university complex. Time for him to put all that aside and stand up for what he earned on that long road to the final out in the World Series. He was there every step of the way and the Red Sox Nation deserves a chance to thank him for this efforts. Shame that he is too "uncomfortable" to show up.